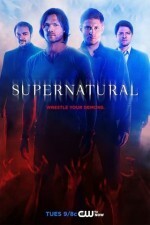 As Supernatural approaches their 300th episode, we’re reminded of what makes this series so outstanding with the mid-season opener “Nihilism.” Sure, saving people and hunting things makes for exciting television, but that in itself isn’t why this series has lasted for 14 seasons. It starts with great characters with complex connections, is maintained by creative storytelling and emotional performances, and is supported with an eye for detail in film and set. “Nihilism” checks all the Supernatural boxes, with an episode that’s both thoughtful and thrilling. “Nihilism” opens in Rocky’s Bar, where Dean pours drinks, resists incorporation, and fights vampires alongside psychic Pamela Barnes, who died back in Season 4. While possessed by Michael, Dean is stuck in a loop. It’s a comfortable loop that gives him just enough distractions to keep him from realizing there’s something wrong. There’s no way to talk about “Nihilism” without noting the amazing work of Production Designer Robert Leader, Set Decorator George Neuman, and Property Master Karolina M. Grant in creating Rocky’s Bar. The details were fantastic, with references and artifacts familiar to fans. It even featured beers from Ackles’ Family Business Beer Company on tap. Director Amanda Tapping (“A Most Holy Man” and “The Future”), who appeared earlier this season as her angel character Naomi, gave the audience a chance to take it all in, with wide angle shots and close-ups of the fun details. It starts with a shot of a squirrel holding a beer, making reference to the bar’s namesake, and shows a moose mounted on the wall. The whole opening scene deserves a second or third watch to take its richness. “Nihilism” was written by Steven Yockey (“Lily Sunder Has Some Regrets” and “Advanced Thanatology”), who joined Supernatural in Season 12. Yockey consistently does more than create an interesting narrative—he takes great care to craft each line to reflect the true nature of the characters. Dean’s contradictions, Sam’s conviction, Castiel’s protectiveness, and Jack’s vulnerability emerge through the dialogue. This character study allows the plot to fall away, revealing emotional and suspenseful storytelling. Yockey’s character-driven writing works especially well in Supernatural, where the actors know their characters incredibly well. Jensen Ackles creates outstanding performances both as Michael and as Dean. One actor playing two characters in the same scene is surprisingly familiar in the crazy world of Supernatural, but “Nihilism” may be the best performance of this difficult process seen in the series. Ackles so completely takes on the role of Michael, you begin to forget that it’s the same actor playing both roles. “Nihilism” shows us who Michael is with greater depth than we’ve ever seen before. We gain an understanding of his nihilistic nature, reflected in his antipathy towards an absent God, his dismissal of humanity, and his negativistic perceptions. Michael tries to bait Sam, Castiel, and Jack by making claims regarding Dean’s true feelings about them, but he’s most effective when attempting to get Castiel to question his own beliefs about God. Dean is Michael’s true vessel, and this nihilistic version of Michael actually appears more aligned with Dean’s worldview than the true believer currently trapped in Hell. The difference being: though Dean may not have much faith in God, humanity, or even himself, he does believe in family. “Nihilism” takes an unexpected turn when Dean realizes that a Cage can take other forms than the one suspended in Hell. Michael isn’t the only character who gets fleshed out in “Nihilism.” Alternative universe Maggie (Katherine Evans) has been fairly forgettable and flat throughout Season 14. Despite being killed and resurrected by Lucifer she’s never been particularly interesting. Up until now, she’s usually been a damsel in distress, but here she leads a group of hunters to save the people of Kansas City from Michael’s monster army, and then rushes to protect the bunker. In “Nihilism,” Maggie finally appears brave and likable. It would have been even more of a win if she hadn’t needed to be rescued at the end. Instead, the bunker battle became an opportunity for Jack to show his commitment to the team. The fight at the bunker did make for a dramatic story. We actually gasped out loud, and for a few minutes thought Jack had his mojo back. It wasn’t until his talk with Castiel that we realized what he was sacrificing to save his friends. Alexander Calvert’s portrayal of Jack combines vulnerability and strength as Jack continues to find his role now that he is without nephilim powers. “Nihilism” takes the time loop trope and adds a twist, with Dean using it to his advantage. Just when you think you’ve had all the excitement you can handle, Reaper-in-Charge (RIP) Billie (Lisa Berry) shows up to add to Dean’s existential angst. Dean’s expression as he ponders his fate reminds us that free will can be both appealing and terrifying. Supernatural gives us a terrific hour of television in “Nihilism,” while filling us with dread about what’s to come.